Today we welcome Austin Crawley! 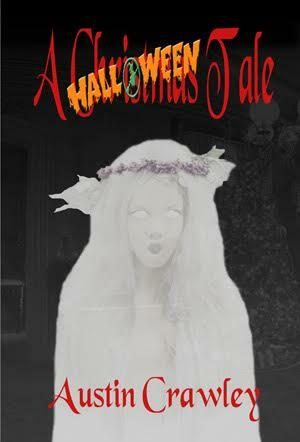 This is release day for his book, which puts a Halloween spin on a Christmas classic. Inspired by the classic tale, three young women decide to hold a seance to raise the spirits of Christmas Past, Present and Future. They don’t expect a result, considering that the ghosts are fictional, but what they call out of the aethyr gives them a creepy holiday they will never forget, if they live to tell the tale! I’ve always enjoyed Horror stories, especially those with a supernatural element. I’ve written my own stories since high school, but this is my first book release. How did you come up with the idea for A Halloween Tale? I wanted to write a Christmas story in the Horror genre and I like ghost stories, so Dickens’ A Christmas Carol naturally came to mind. Having participated in seances as a child (just fun stuff), a ‘what if?’ came to mind. What if someone tried invoking these ghosts from the Dickens story? What could possibly go wrong? Zombies! I’m fed up with zombies (no pun intended.) They need to eat the sparkly vampires and go back to their graves for good. I’ve got a few lined up but my next book is about a mailbox that takes letters to dead relatives. I’ll have more to say about it closer to release. That’s always a hard question because it changes with my moods. Right now, the Classic Phantom of the Opera is my favorite book and An American Werewolf in London comes to mind for favorite movie. I like a lot of comedy Horrors. Austin Crawley writes Horror with a supernatural twist. His lifelong love of ghost stories and interest in comparative religions has led him to seek the darker corners of human existence and to exploit them in prose, touching on our deepest fears. His childhood role models come from the original Addams Family series, though he has not yet worked out the practicalities of keeping a lion as a pet.